Do you want to enjoy your summer nights without having to deal with any mosquito bites? Are you looking for a safe and eco-friendly alternative to chemically loaded bug repelling lotions? Do you need an insect repellent that will not need any electricity to function? The Mega Candles citronella candles are everything you've been looking for! The patio citronella candles are made with special attention to detail and only the best quality materials for unique results. The repellent candles are hand poured and made with paraffin wax. They also have cotton wicks for long lasting burning time. The non-toxic citronella candles will keep all annoying bugs and insects away so you can stay protected from bug bites. This natural repellent will protect you against mosquitoes in the safest and most convenient way possible. These amazing mosquito candles have a beautiful design that will look amazing on your porch, patio or yard. They have a nice scent and they will give you a romantic flickering light for the perfect atmosphere. THE PERFECT SET: This unique set will provide you with all the candles you'll need to keep mosquitoes away during the summer! 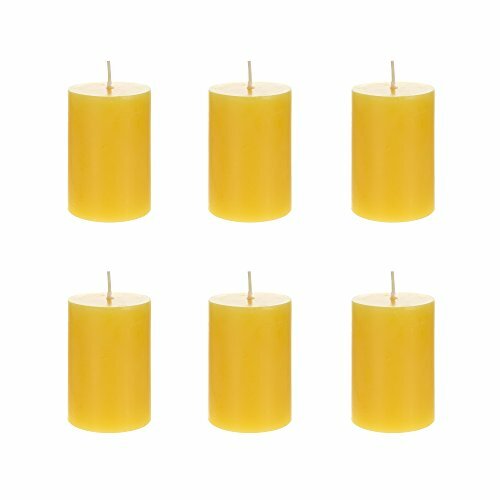 The citronella candles have a round pillar design and they come in stylish yellow so you can place them on your patio or porch and create a beautiful atmosphere. NO MORE BUG BITES: The citronella candles will help you keep insects away so you can enjoy your summer nights with no bug bites! The citronella candles will work as a natural and convenient mosquito repellent so you can stay protected without any dangerous chemicals or annoying lotions. PLEASANT ATMOSPHERE: The mosquito repelling summer candles are beautifully scented so you will never have to worry about unpleasant odors. They are perfect for outdoor use and essential for every camping trip so you can enjoy their beautiful light while staying protected from bugs. PREMIUM QUALITY: The anti-mosquito candles are crafted to perfection with the finest quality materials so you can enjoy unique results. The candles are hand poured and made with 100% paraffin wax. They also have 100% cotton wicks so they can stay lit with no worries. LONG LASTING: The mosquito repelling citronella candles measure 2" x 3" in size and they are very long lasting so you can enjoy maximum protection for longer. Each yellow citronella candle can stay lit for up to 10 hours and keep all mosquitoes away.